Growing Up in Kampong Potong Pasir Big Tree in a Small Pot Goodbye My Kampong. Potong Pasir 1966 to 1975 When A Flower Dies My Mother-In-Law’s Son Kampong Spirit: Gotong Royong, Life In Potong Pasir 1955 to 1965 Your Body Gateway to the Divine Shadows Across the Sun Body And Mind Sculpture Frog Under A Coconut Shell Rasa Singapura/Taste Of Singapore Isn't Singapore Somewhere In China-Luv? Kampong life in Singapore did not end in 1965 with her independence. In Josephine Chia’s new collection of non-fiction stories, the phasing out of attap-thatched villages, the largest mass movement in Singapore, is set against the backdrop of significant national events. 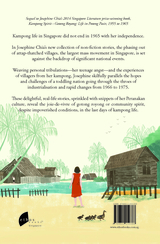 Weaving personal tribulations – her teenage angst – and the experiences of villagers from her kampong, Josephine skilfully parallels the hopes and challenges of a toddling nation growing through the throes of industrialisation and rapid changes from 1966 to 1975. 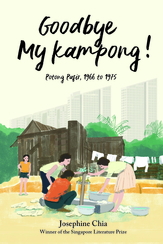 These delightful, real-life stories sprinkled with snippets of her Peranakan culture, reveal the joie-de-vivre of gotong royong or community spirit, despite impoverished conditions, in the last days of kampong life. For me, yoga is a living practice, every single hour, every single day in my ordinary everyday life.